I recently learned about Podzilla — a Linux distro for the iPod. iPod already has some recording support, but here’s the kicker — you can pay the $50 for the iPod recording hardware and get 16-bit recordings at 8kHz (telephone-ish quality) or you can install Podzilla for free and record whatever you want at up to 96kHz (DVD audio quality). Why is recording crippled on the iPod? Well, part of the answer is that the market for voice recording hardware is pretty small. Dedicated voice recorders are incredibly expensive, and Apple is not at all in that market. They’re out to sell their iPods and get people to use iTunes. Furthermore, voice recording doesn’t need amazing quality, so the low audio rate is sufficient for most. However, this is not a market issue. If Apple really wanted to make an iPod capable of high quality recording, they could have. Their competitors, such as Creative, Archos, and iRiver, have MP3 players full quality MP3 and WAV recording (44kHz, CD quality). My Creative Jukebox 3 even has digital recording inputs. In fact if Apple was concerned about being competitive, they would have included high quality recording in the iPods from the very beginning. Which leads me to an interesting conclusion: Apple was pressured by the RIAA and big music distributors to disallow high quality recording on iPods. If you’re the RIAA, you’re worried that someone can take a CD, plug it’s output right into an iPod, then play the CD and end up with MP3s on the iPod (or AACs or whatever their damned format is). Worse yet, someone can bring an iPod to a concert with some microphones and make great quality bootlegs (because bands haven’t learned that if they could make live concert CDs on the spot, they could rake in the money). I think Apple was either told by the RIAA no recording on the iPod or intentionally crippled it to avoid the wrath of the music industry in the first place. Think about the case if Apple had allowed high quality recording… “Sorry big music distributors, but we released our tiny music player with the ability to record the same music of yours that we sell online. We know people will record music themselves and avoid paying you the royalties you so desperately want. But we don’t really need the iTunes store to sell iPods because we’re Apple and people will buy our hardware since it looks cool, is vastly overpriced, and has less features than our competitors.” Or something like that. All of this makes me wonder about the iPod photo, or whatever that new device is. Already most of Apple’s competition has moved on to portable movie players, some of which even record video, so why is Apple just moving to photos and not movies? My prediction is that Apple will have a movie playing iPod just as soon as they create iMovies (or iFilms or something like that, like iTunes but for movies… call it Quicktime?) and sort out the issues with the MPAA and big movie distributors. To put this another way, if Apple doesn’t get into movies, then it’s because they couldn’t line up the studios. I think most people are comfortable making MP3s from their CDs now, but Apple would have to overcome a huge hurdle to get DVD ripping software on everyone’s computer. Why would you buy iTunes if you already own the CD? Likewise, why would you want to buy videos online when you already own the DVDs? The MPAA has harshly attacked anyone releasing DVD ripping software, so Apple would have to get their blessing before the iPod + video or iMovies comes out. But that’s just my opinion. Back in reality, I don’t know of any other portable music player manufacturers that also have a vested interest in selling online music except for Sony, but then Sony has been very quiet about their efforts, and they own the music they’re selling anyway. Since Steve Jobs is already in bed with the movie studios (Pixar) and since iTunes has been more successful than anyone could have predicted, I’m sure he’ll be able to convince the other big movie studios to fall in line with the portable revolution. The iTunes store is as important to iPod’s success as the iPod itself — both for the RIAA’s blessing and the iPod’s overall success — so a movie version of iTunes would be equally essential for Apple to break into the handheld movie player market. I’m certain this isn’t the only instance of the RIAA and others putting pressure on big software companies to bow to their whims. Microsoft wholeheartedly jumped onto the DRM bandwagon, much to the delight of the media industry, with recent versions of their Windows media formats. I just wonder if MS did that before or after their conversations with those companies. I wouldn’t characterize these as “alliances” as much as “necessities for doing business.” If MS hadn’t bowed to the pressure of the RIAA and others, then someone else would have. Therefore, I say MS and Apple both made the right decision for their business, much to the detriment of all the people stuck with their hardware and sofware. Pressure like this goes beyond software and hardware, but I’ll deal with those aspects some other time. I’ll give you one other similar example. There’s a Palm device — the Treo 650 — that was made specifically for Sprint and is pretty much a combo cell phone and PDA. The 650 came crippled in that you couldn’t use its Bluetooth to connect to the Internet. Why would Sprint let you do that anyway? Someone hacked it and enabled that feature; supposedly it was always there but just hidden. That same person also figured out that you can use an SD WiFi adapter with some driver hacks — a wifi adapter that Palm wouldn’t release drivers for. Sprint certainly pressured Palm just like the RIAA pressured Apple; both Sprint and Palm want to milk the cell phone market for everything they can. Back to Apple… Based on what Apple did before, I bet their iPod photo already has video support. It’s just crippled. And so if you’re patient enough, wait for a version of Podzilla to uncripple the video playback support built into their new iPod. It’s either that, or wait until a sanctioned, overpriced, under-featured iPod video finally comes out. Or just pick up one of the non-Apple portable media players that already support video playback and avoid the whole iPod thing in the first place. How many blogs are there? This is one of those questions of incredible interest without any reliable answer. A few companies have been nice enough to provide information that give us some estimate of how large the blogging world is. Unfortunately, most people don’t take the time to decide how reasonable (or not) those numbers are. A side note… My policy with this website is not to include external links unless those sites are seriously something you should check out. In other words, all these other sites I refer to but don’t link to do exist; I just hope you don’t stumble upon them because they’re useless crap and I don’t want to increase their Google rank inadvertently. Also, for those links I do have, there are probably other places I should have citations for data but I don’t include them because I don’t add multiple links to the same page. Just look around and the data is linked to somewhere else. Let’s say 11% of American Internet users really do read web logs or diaries. And other polls suggest about 200 million Americans (about 2/3 of us) have Internet access from home, work, ‘net cafes, whatever. Do the math and BAM — 22 million Americans read blogs. But then some people take this way too far. Somewhere around 800 million to a billion people worldwide have Internet access, so you multiply 11% by 1 billion ‘net users and 110 million people read blogs. You can do the same math with the number of bloggers and you get about 20 million of them. 110 million blog readers, 20 million blogs, right? Nope, nothing is that simple. Look at LiveJournal’s statistics. 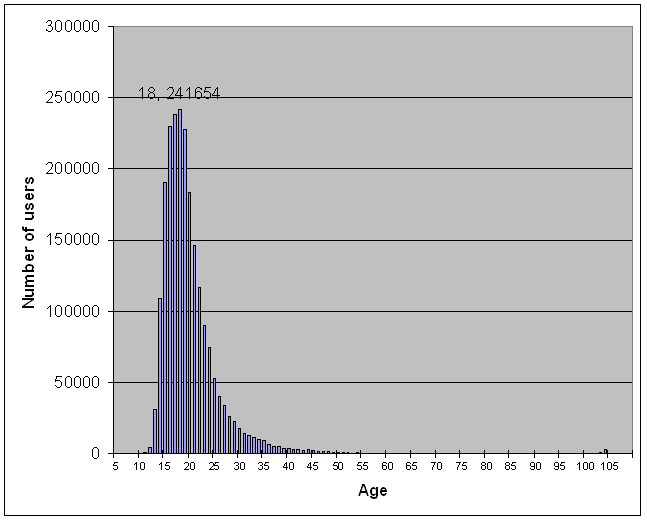 By their numbers, more than 35% of LJ’ers are under 18 years old (graph below). Pew missed a significant part of the blogging population by polling only 18-and-ups, and everyone citing that Pew number as absolute truth missed what I think is the most important blogging group there is. LiveJournal users shown by age. Taken from http://www.livejournal.com/stats/stats.txt. Nov. 12, 2004. The peak of this graph is at 18 years old, and about 36% of users are under 18. Pew missed the mark by a bit. So how much did they miss it by? I’ll make a few guesses. That 35% of under 18 LJ’ers is probably an underestimate. Half of the people using LJ didn’t bother answering the age part of their profile, and I believe most of those non-responses are under 18. Furthermore, there are liars. You can see a little peak around 104 years old; those people put down their age as being born in 1900. And of course, if you’re going to have a publicly articulated persona, you want to make yourself look as cool as possible, and older is cooler. I’m surprised there aren’t more kids who are 69 years old, but then again how many of them can do the math and figure out they should be born in 1935 for that. Remember that the Pew study was only about Americans and their Internet use, not the world. If 11% of Americans are doing it, you can be certain that number will not hold for the entire world. While Americans make up about 1/4 of the Internet population, they’re probably a majority of the blogging population. LiveJournal records use by country, and a little under 80% of blog writers are from the U.S. So even if 25% of ‘net users are American, we dominate the blog world. According to the NITLE Blog Census (which I use with caution as I’ll explain later), about 80% of their crawled are written in English, but about 1/3 of all web sites are English and 2/3 of English web sites are in the U.S. Anyone who simply extrapolates global ‘net use to blogging behavior will be off big time. Graphs of each are below, and the key to the rankings are at the end of this page. 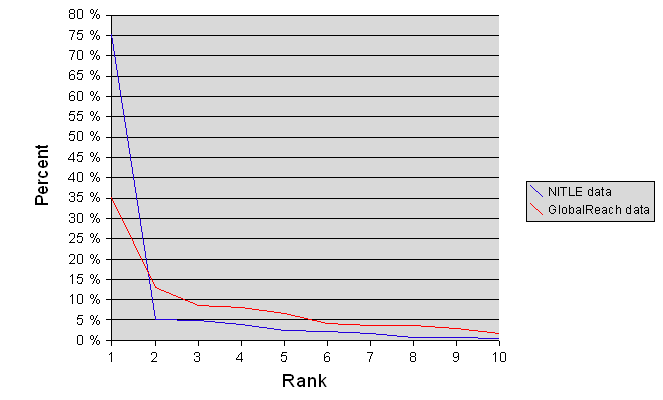 Though it would be comparing apples and oranges, the NITLE distribution is almost exactly the same as the LiveJournal data (above). Someday it might be fun to delve deeper into the language/country blog differences, but this is as far as I’ll take it for now. One other significant issue is that of definitions. The Pew poll asked if people had read, written, or contributed to a web log, blog, or web diary. I don’t want to digress on such a philosophical problem, but people have different understandings of what a blog or web diary is. Did people say yes about writing a web diary when it was just their family’s web page? Does Slashdot count or not? Who knows. Problems like this always happen, so we’ll have to trust that people know a blog when they see one. I had a chat with Mary Hodder with Technorati back in October about the big number. (FYI, Technorati deals with all information blog and that’s about it.) She said Technorati estimated the number of blogs to be about 12 million, and that they have over 4 million blogs indexed. BBC News recently had an article where they cited Technorati as saying there are 4.5 million or so blogs in existence. Funny, the BBC number is a lot like the number Mary cited for Technorati’s crawled blogs. I guess you can’t even trust reputable news sources for accurate blogging information. It gets worse. Other “authorities” for blogging size are cited too often without reflecting on how they got those numbers. NITLE’s Blog Census currently has around 2 million indexed pages. I hope nobody is using their numbers yet. They’ve only gone though less than 5% of the over 5 million LiveJournal blogs (their <5% is less than the number of journals active in the last week). And like I said before, some parts of the sample, such as under 18 bloggers, are only evident in certain domains. Even if NITLE is using a 95% confidence interval, it’s meaningless if they aren’t sampling from the entire population. Then there are the “other” polls… Most of these I question their methodologies. A few had open online polls, so you have no idea how representative the poll results are of the entire population (like the poll I cited in my last post. Others look only at LiveJournal or similar blog hosting sites without taking into account the non-blog-service-using people. Even with these complaints, at least those polls had enough intelligence to mention these facts along with their poll results. What does Technorati do that the rest don’t? Their numbers are based on a few things. First, they have web crawlers made specifically for blogs, that use the links in those blogs to find other blogs and add the new ones to their search. They let people submit their blogs to the engine if it’s not already there. They also get “pings” whenever a new blog is created on certain blog hosting sites or when new blog software is installed on an individual’s site. With all this information, the data and estimates they give are probably the most accurate if any are to be trusted. So how many blogs are there? I have no idea. If I had to wager, I would put my faith in Technorati’s numbers since I trust their methodology the most and since they have much to lose if they’ve got it wrong. Technorati also said (in that same BBC article) that the number of blogs is doubling every 5 1/2 months — 10,000 or so a day, a trend maintained for the last 18 months. That 12 million I cited earlier is probably closer to 15 million blogs now. I’ll ignore other counting issues like private blogs (as in not publicly accessible), abandoned blogs, and fringe blogs (without incoming links so they can’t be crawled) except to say these make defining what is and is not a blog even more difficult. This stuff is pretty hard to do even with all the data that’s already out there. That’s enough for now. From here, I’ll get into more detail about blog readers and writers. Top 10 rankings for the Global Reach country data. Top 10 rankings for the LiveJournal country data. Top 10 rankings for the Global Reach language data. 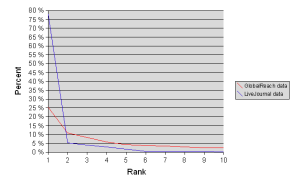 Top 10 rankings for the NITLE language data.